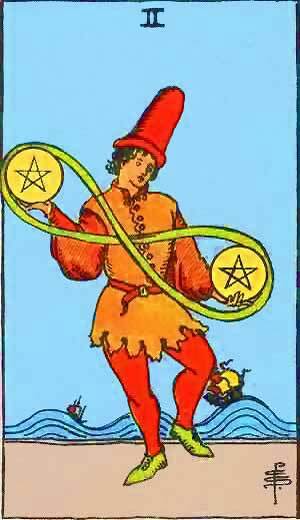 The Two of Pentacles in a Tarot reading is about happy times in a relationship, however there are troubles some of which maybe more imaginary than real. In the reversed position there maybe some bad news and you put on a brave face. Troubles are more imaginary than real. Two of Pentacles – Embarrassment, Worry, Difficulties. The Fire on the Sixth house, the house of Virgo. Now here the so-called reversed meanings in the tradition seem to hold the most current significances of this house. Which once more warns us against attaching too great, if any, importance to the idea of ‘reversed’ position. The tradition does not give a very clear conception here, on the whole. The word ’emotion’ is not in its place; as to embarrassment, this is correct: the influence of the sunny and Venusian fire on this house of infinite possibilities must naturally cause ’embarras du choix,’ the difficulty of choice, and the one possibility hindering the other; giving too much force and attention to little or subordinate things and persons. There can be very little harm, however, in any card of the pentacles suit; the greatest evil done here might be that too little profit is earned in proportion to the labour given to it. On the other hand this card must necessarily mean good and conscientious work and fidelity of servants, agreeable and satisfactory work, reasonable remuneration, and consequently joy. The agreeable stimulation which it gives to the nervous system must cause gaiety, recreation, etc. Good health is also one of the results. On the face of the cube, surrounding a pentagram, is a zodiacal wheel, corresponding to the Qabalistic attribution of the Sphere of the Zodiac to the Divine Number 2. The faces on the two coins suggest polarity, for one is male and the other is female. First decanate of Capricorn, from December 22nd to December 31st, under the rulership of Saturn. Harmony in the midst of change, alternation of gain and loss; change of occupation; travel in quest of wealth; ups and downs of fortune; a visit to friends. It intimates discontent, foolishness in the management of resources, restricted condition of material affairs due to bad management; the Querant is probably too talkative and too suspicious. He is kind, but inconsistent, and should avoid arguments. More information on the Two of Pentacles Tarot card. This entry was posted in Tarot, Runes and Divination and tagged astrology, capricorn, feelings, harmony, love, money, pentacle, pentagram, two of pentacles, zodiac. Bookmark the permalink.